September! 9 months of the year done and my Big Birthday has gone by. I should probably stop celebrating it some time soon! 😂 Time to check in with my goals for the year and see how things are progressing. Goal achieved! 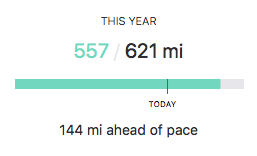 I’ve been aware for some time that I would reach my goal distance before the end of the year (assuming no significant time out) and my final run of September took me just beyond the distance. I’m pleased to have achieved this with so much time to spare, but that time gives me the opportunity to now find out how much more I can add to the total. Place your bets…! I started the month spot on with this one, but with my trip away I managed to miss a couple of home sessions in the weeks wither side, which I’m not terribly proud of. What I’m finding with my current routine is that 4 sessions of yoga is easily achievable but sometimes the 5th eludes me – more out of laziness/carelessness than anything else. I have been trying to combat that with a short routine before bed to help me relax and unwind so hopefully things are back on track again. 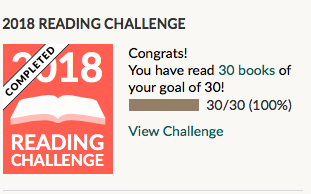 Another goal achieved! At the end of the month I reached 30 books and was rather stunned to find that I had managed to read so much this year. 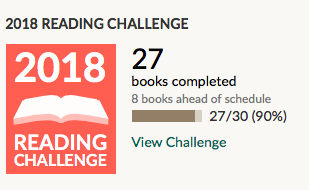 With 3 months of the year to go (and some holiday time) I wonder what my final total will be? I’ve been really enjoying my reading this year and part of that is because my involvement with some online/social media book groups has given me the opportunity to read things I might not otherwise have chosen and kept me on track with my reading in order to contribute to the discussions. I think I’m still doing ok with this one. I certainly tried to be in bed at a reasonable time before my trip and needed plenty of sleep the week after so although I don’t keep specific note of this one, I do keep an eye on the time on “school nights” and try to be heading for bed before 10. I had fallen off the wagon with this one over the summer but am back on track now. I’m taking part in a 100 day challenge with a Facebook group I’m in and my choice was to watch a TED talk every day for 100 days. This has really helped to get my focus back on this goal – an activity I have really enjoyed – and I am doing well so far. I did miss a couple of days when I was in Disney, but have since “caught up” by watching a couple of extras so I am still on track for 100 talks in 100 days. Any recommendations? On the basis that I listen to a podcast per day on my drive home (and usually one or two extras across the week) this one is still going well. I have fallen slightly behind with my regular podcasts again with my extra rest days, but I’m sure I’ll catch up during the school holidays as I’ll have more opportunities to listen. My most last-minute one yet as I responded to the prompt It Builds Character on the last day of the month! The rigours of the school day mean I’m back on track with this one too as my time to even touch my phone during the day is so limited. Beyond a quick check of emails at lunchtime, I don’t really use my phone much at all. I’ve also got back into the habit of checking it when I get home then getting on with other things for the evening so I don’t get sucked in. Social media etc definitely have a positive place in my life, but it’s too easy to be distracted by the more frivolous elements so a balance has to be found. This first term of the school year has been busy (I know they’re all busy but it has felt busier than this term usually does) so I’m really pleased with how I have approached my goals this month. Roll on October! How are you doing with your goals for the year? Anything achieved? Any goals need reset? Despite taking a bit of time out over the summer to allow a niggle in my ankle to resolve, this one is still well on track. 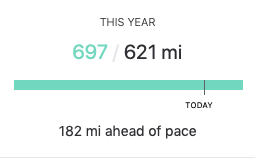 Thanks to heavier mileage at the start of the year I finished August still ahead of the pace and with a bit of wriggle room if I need to ease off again. 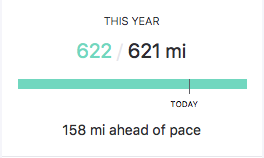 Still totally achievable just through my regular running and with no need to artificially chase miles. Phew! I do really love my yoga, but I must admit that there have been too many weeks where I only managed 4, or even 3 yoga sessions. I think I have become too caught up in using sequences of around 20-30 minutes and need to remember that I can do much less and am perfectly able to fit in a 5 minute practice before bed. Something to work on in September. My reading has been going so well this year and I feel like I’ve really re-engaged with one of my favourite pastimes. I think because I have involved myself in some online book groups, it’s given me a bit more of a focus to actually read more often than a few minutes in bed at night and I’ve read some books that I wouldn’t otherwise have picked up. 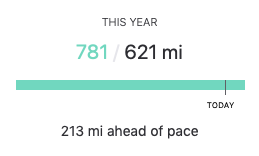 As a result, I’m way ahead on this one as well and am really curious to see where my total goes at the end of the year. This one is perhaps a little harder to measure for August. The part of the month that was still the school holidays allowed me to be more flexible with my bedtime. I was consistently getting up around 7am (to feed the kittens!) and going to bed around 10pm, but there was no need to worry about being in bed sooner. Once term began, at first I was probably a little disorganised as I was out of my normal routine and not really monitoring if I was in bed before 10pm. As we move into September, this is one for me to keep an eye on in order to ensure I’m as well rested as possible. I really don’t know what happened here. I began the year watching a talk every weekend, but somehow lost the routine and have struggled to get back on top of this. Hopefully at the end of September I will be able to say something different as I LOVE watching the talks, I just need to be more conscious of sitting down for 15 minutes with one. I can easily find 15 minutes if I put my mind to it. I’m definitely getting this one done. I am such a podcast addict now and am aware of a few I would like to try, but am already listening to so many. I don’t think I could manage without podcasts now and I have learned so many interesting things from them. In August it was a photo prompt inspired by a visit to South Queensferry and I responded to the prompt Bridge. I think this one is going ok. In the holidays I was using my phone, etc more, but I also had a bit more time at my disposal. Now I’m back at work again, my time for faffing about with my phone is much more limited, and the time I am spending on social media is more related to groups I help with and responding to book groups than random and endless scrolling. 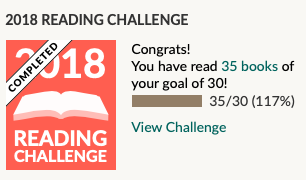 I’m comfortable with that, especially since I have been able to read so much this year as a result. So overall not too bad a report for August. In September I’ll be focusing on re-establishing my term-time routine to make sure I find the time I want for yoga as well as getting back into the habit of watching TED talks. Just 4 months of the year left…! How have you progressed with your goals this year? Any TED/TED X talks to recommend? Laura was a self-certified couch potato. Until six years ago she couldn’t run for more than a few minutes at a time. Since then she has completed eight marathons and is now a committed triathlete. But Laura couldn’t have achieved what she has without her mentor and friend Katie. A life-long runner, fair-weather cyclist, and born-again swimmer, the more experienced Katie helped Laura through the ups and downs of training for a triathlon. Their triathlon journey gave them the opportunity to break boundaries while forging a life-long friendship. Tricurious tells Laura’s and Katie’s story, with energy and humour. Filled with anecdotes and advice about the trials and tribulations of preparing for a triathlon, this inspiring book will leave you hungry to experience the joy (and pain) of swim, bike, run. You may know Laura Fountain from her book The Lazy Runner which documented her journey from couch potato to marathoner. As with many runners, Laura asked herself, “what next?” and the answer was triathlon. While triathlon may not (yet) be on the cards for me, I enjoyed reading about her journey towards the iron distance from being a complete beginner. What drew me to this book, apart from my knowledge of Laura from her previous book and her blog, was how accessible the it was. When trying something new we all experience fears and doubts, we convince ourselves that everybody else was somehow born knowing how to do it and that we are going to make complete fools of ourselves. This book takes us through the process of getting to grips with each of the disciplines (including learning to swim pretty much from scratch – usually the most intimidating aspect of triathlon for beginners) and is filled with amusing stories of mishaps and mistakes, as well as answering all those questions that we’re too afraid to ask, about the things no one ever tells us. Throughout the book we get Laura’s perspective as a beginner, as well as Katie King’s perspective as the more experienced triathlete, so those with a triathlon or two under their (race) belts can still get something from this book. We get a glimpse into training for iron distance events as well as some advice on how to ensure a balance between training and our “real” lives. We are also shown, crucially, that it’s ok not to succeed the first time – whether that’s swimming a length, clipping into our bike pedals or making the cut-off time in an iron distance event. A great example of this was Laura’s first iron distance tri in which she didn’t feel great during the swim and lost too much time. As a result, she didn’t make one of the bike cut-offs and her race ended. It would have been easy to wallow in self-pity, but instead Laura set up her own personal event not long after. With no fanfare, just her watch to give her the distance markers and the support of her loved ones, Laura completed the iron distance triathlon she had trained for (her “Iron Person”) and did so within her own meaningful cut-off times – completing the swim within the session times at the reservoir, being off her her bike before her nieces went to bed and finishing the run in time for last orders in the pub! Amazing! I loved the interplay between the two writers and the “turn about” approach to chapters. I also loved the honesty, sense of humour and practical advice they both give. I’d say it’s the ideal book for women keen to try triathlon, and should I ever decide to give it a go I’ll be re-reading this book as it shows quite clearly that anything is possible.